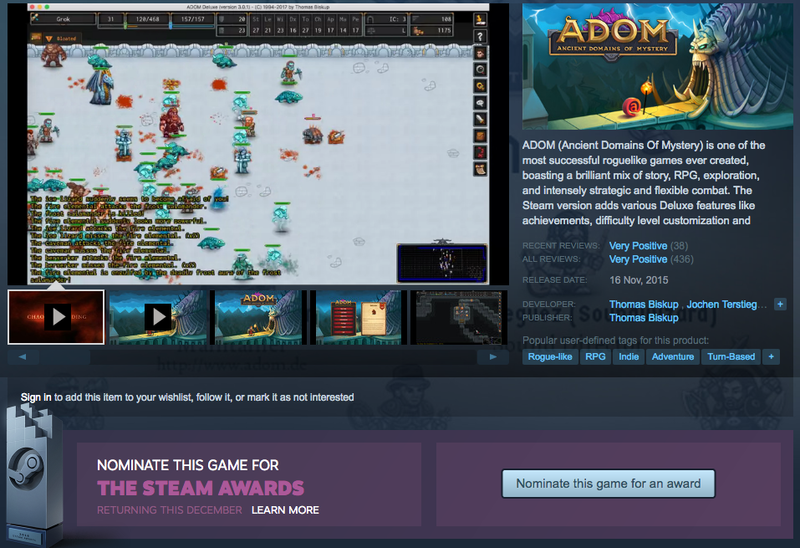 Please nominate ADOM for the Steam awards! Being on Steam (and being successful there) is very important for us as this on one hand guarantees the income we need to continue developing ADOM full throttle and also is important for the future of Ultimate ADOM. as that one seems most appropriate to me with a 25+ year history of ADOM development. Most of our attention right now goes into finishing the final crowdfunding campaign promise: the global highscore server. The alpha version already is running and soon our prerelease testers will be able to use it for beta testing (and then it's available for everyone who owns a Deluxe version - e.g. the Steam version). In the future we intend to provide detailed game statistics both for your personal games as well as for all Deluxe games ever played. This should help comparing your play level to other players and give us detailed insights on how to evolve the game and its difficulty level. That's also what I am working right now - with a little luck ADOM 3.0.3 (or ADOM 3.0.4 as the latest) will have a new statistics module that kind of logs major events during your game and creates a snapshot of many important statistics. And soon afterwards it will be on Steam with the global highscores with our new Rogueleague server. Demo video coming shortly as soon as I finish the UI for that. 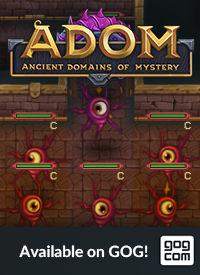 If you haven't bought ADOM on Steam now is the best time to do it as you can get it at a 10% discount (which is the maximum we ever are going to offer - we prefer adding value instead of offering discounts). 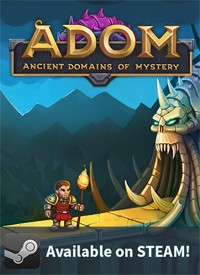 It's available for a very brief while still at this discount - so be quick if you have been thinking about getting ADOM. When can we expect 3.0 release on Steam? There will be one more prerelease test version and hopefully then we finally can go to Steam. So probably like a week or so at most. But it wasn't 25 years of continuous development, right? 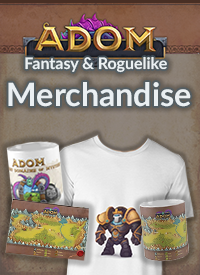 You picked up Adom when you realized you can crowdfund it and hire other people do stuff like graphics. I would call the category "labour of love for money". Being paid for said labor doesn't exclude it from being a labor of love. The key is motivation. I *very* much doubt financial rewards are the #1 goal here. It's a means to an end, sure, but other than that I'm 110% convinced TB's smart enough to find waaay easier avenues of generating personal income than the most fickle and unstable market imaginable. (I'm looking at you, games! ).